His Lordship sent this around to all the usual suspects asking that it be given a wide audience. I’m traveling today. About 18 months ago, as soon as I heard of Dr. Richard Müller’s Berkeley Earth Temperature project, I sent an email to several skeptical scientists drawing their attention to his statement that he considered his teamâ€™s attempt to verify how much “global warming” had occurred since 1750 to be one of the most important pieces of research ever to be conducted in the history of science. This sounded too much like propaganda. My doubts about Dr. Müller’s motivation intensified after I met him at the Los Alamos Climate Conference in Santa Fe, New Mexico, late last year. We lunched. He was visibly disappointed when I said that I was happy to accept the official temperature record, at least for the sake of argument. And he subsequently seemed uninterested in getting to grips with the real divide between skeptics and true-believers, which has little to do with the accuracy of the temperature record and much to do with climate sensitivity â€“ the question how much warming we will cause. In this reply to Dr. Müller’s much-touted editorials in the New York Times and the San Francisco Chronicle, I shall demonstrate by Classical methods that his principal conclusion “that global warming is real, that the prior estimates of the rate were correct, and that the cause is human” is incorrect a priori. Yes, the world has warmed since 1750. However, even if one accepts Dr. Müller’s estimate of 1.5 Co warming since then, that rate is indeed well within the natural variability of the climate. Indeed, in the 40 years from 1695 to 1735, Central England (not a bad proxy for global temperature change) warmed naturally at 0.4 Co per decade, seven times faster than the 0.057 Co per decade he finds in the 262 years during which we are supposed to have influenced the weather. Natural variability, therefore, is sufficient to explain all of the warming since 1750. No other explanation is necessary. Accordingly, it is not legitimate to claim, as the Berkeley team claim, that in the absence of any other explanation the warming must be attributed to CO2. That claim is an instance of the argumentum ad ignorantiam, the fundamental logical fallacy of argument from ignorance. It is not sound science. Dr. Müller’s assertion that fluctuations in solar activity are too small to have any effect on the climate is fashionable but erroneous. At the nadir of the Maunder Minimum, the 70-year period from 1645-1715, there were almost no sunspots. During that solar Grand Minimum, the Sun was less active than during any other similar period since the abrupt global warming that ended the last Ice Age 11,400 years ago. The weather was exceptionally cold both sides of the Atlantic: the Hudson in New York and the Thames in London frequently froze over in the winter. As solar activity recovered at the end of the 70-year period of exceptionally few sunspots, global temperature recovered very rapidly in parallel. Man cannot have had any measurable influence on the rapid warming from 1695-1735. The warming, therefore, was natural. The solar recovery may have been amplified in some manner, perhaps by Dr. Svensmark’s cosmic-ray effect, so as to cause much (if not all) of the rapid natural warming over the period. Or some other natural cause may have been present. But Man cannot have been the cause. It is worth noting, in passing, that solar activity increased quite rapidly from the Grand Minimum of 1645-1715 to the Grand Maximum of 1925-1995, peaking in 1960, during which the Sun was more active than at almost any other time in the past 11,400 years. Yes, prior estimates of the warming rate since 1750 may have been correct, but the mere fact of that rate of warming tells us nothing of its cause. There was considerable warming in the Middle Ages: indeed, Dr. Müller concedes that the weather may have been every bit as warm then as now. Yet we were not emitting CO2 in vast quantities then. It necessarily follows that the cause of the medieval warm period must have been natural. Accordingly, there is no reason why much (perhaps nearly all) of the warming since 1750 should not also have been natural. No Classically trained scientist could ever have uttered such a lamentable sentence in good conscience. For Dr. Müller here perpetrates a spectacular instance of the ancient logical fallacy known as the argument from false cause — post hoc, ergo propter hoc. However closely the fluctuations in one dataset appear to follow the fluctuations in another, one cannot legitimately assume that either caused the other. Dr. Müller admits elsewhere in his editorial that mere correlation between one data series and another does not imply a causative link between them. Nor, one should add, does it tell us which caused which; nor whether all possible natural influences that might have driven both data series simultaneously have been allowed for. In logic, though correlation does not necessarily imply causation, the absence of correlation necessarily implies absence of causation. During the past 15 years, notwithstanding record increases in our CO2 emissions, there has been no global warming at all. The former, then, cannot have been the principal cause of the latter. Dr. Müller describes the current stasis in global temperature as “the ‘flattening’ of recent temperature rise that some people claim”. Yet the failure of temperatures to warm at all over the past 15 years is plainly evident in all the principal datasets. If Dr. Müller were as “careful and objective” as he claims, he would surely concede that there has indeed been no global warming for a decade and a half. He would not have described it merely as a phenomenon “that some people claim”. He is entitled to his opinion that “the ‘flattening’ of recent temperature rise that some people claim” is not statistically significant. However, I beg to differ. Since CO2 emissions have risen at a record rate during the past 15 years, it necessarily follows that the failure of the planet to warm at all over that period points to a natural influence strong enough to overcome — at least temporarily — the rather weak warming effect of the large additional volume of CO2. What might that natural influence be? Step forward the Pacific Decadal Oscillation, a naturally-occurring warming and cooling cycle. In 1976, the PDO switched suddenly from its cooling to its warming phase. Global temperature rose rapidly till late in 2001, when the PDO switched just as suddenly to its cooling phase, since when there has been no global warming. The global temperature anomalies since 1850, compiled by the Hadley Centre for Forecasting, show three periods of warming that lasted more than a decade: 1860-1880; 1910-1940; and 1976-2001. These periods coincide with the cyclical warming phases of the PDO. On any view, the first two periods could not have been much influenced by us. Only in the most recent period were our CO2 emissions sufficient to cause some warming, at least in theory. Yet in all three periods the warming was at the same rate: just 0.17 Co per decade. The warming rate in the most recent of the three periods was â€“ within the margin of statistical error — no greater than in the two earlier periods. This inconvenient truth vitiates Dr. Müller’s conclusion that Man is the sole cause of warming. Dr. Müller’s claim that his results are “stronger” than those of the IPCC also needs some qualification. If he were right that all of the 1.5 CÂ° warming of the past 250 years was our fault (or, rather, our achievement, for warmer weather is better for life on Earth than cooler), it would follow, unexcitingly, that his estimate of climate sensitivity is more or less identical to its own. Here is the math. To obtain climate sensitivity, one multiplies the radiative forcing of 5.35 times a given proportionate increase in CO2 concentration by some climate-sensitivity parameter. The IPCC’s implicit value of that parameter over the 200 years to 2100, on all six emissions scenarios, is 0.5 Co per Watt per square meter. Dr. Müller’s analysis covers 260 years, so let us call it 0.6. CO2 concentration has risen from 280 ppmv in 1750 to 390 ppmv today. Note also that the IPCC increases the estimated warming from CO2 by 43% to allow for other greenhouse gases. Then the expected warming since 1750, on the assumption that we caused all of it, is simply 1.43 x 0.6 x 5.35 ln(390/280), or 1.5 Co, which is Dr. Müller’s value. In short, the IPCC’s central climate-sensitivity estimates are already predicated on the daring assumption that all of the warming of the past 260 years was caused by us, even though they state no more than that “most” of the warming was our achievement. What, then, is the implication of Dr. Müller’s result for global warming to 2100? That is the $64,000 question. By that year, the IPCC estimates there will be 710 ppmv CO2 in the atmosphere, compared with 390 today. Its current central estimate, as the average of all six emissions scenarios, is that there will be 2.8 Co warming, of which 0.6 is warming that is already in the pipeline as a result of our past sins of emission. That leaves 2.2 Co caused by the greenhouse gases we shall add to the atmosphere this century. Calculating on the basis of Dr. Müller’s result, and taking 0.4 as a suitable climate-sensitivity parameter for a period as short as 90 years, one would expect 1.43 x 0.4 x 5.35 ln(710/390), or 1.8 Co warming. This result is not “stronger” than that of the IPCC, but just a little weaker. To reach Dr. Müller’s implicit result, one would have to assume that natural influences on their own would have caused a little cooling over the past 260 years. But that assumption would contradict the exceptionally rapid increase in solar activity from Grand Minimum to Grand Maximum over the period. If Dr. Müller had had a Classical training, he would have been made familiar with the dozen logical fallacies first codified by Aristotle 2300 years ago. He would not have attempted to draw any firm scientific conclusions as to causality merely from a superficial and in any event inadequate and uncertain correlation; and still less from a monstrous argumentum ad ignorantiam. Perhaps it is time to ensure that every scientist receives a Classical training, as nearly all of them once did. Why is the proposed causative link between CO2 and temperature a fallacy but the proposed link between sunspot activity and temperature not? Rich: According to the article, temperatures have risen rapidly during times when (man-made) CO2 was not rising and now temperatures have not risen rapidly during recent times when (man-made) CO2 has risen rapidly. This failure on both sides of the coin would call the CO2 link into question. There has evidently not been similar problems with sunspot activity. You may disagree with the article on those points, but if they are true, his conclusions follow logically. 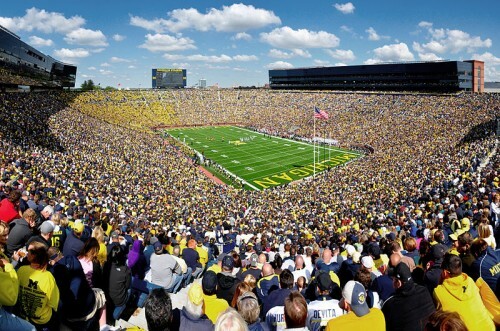 That shows about 100,000+ people at a football game at the recently renovated Big House (which holds about 109,000). Imagine each person is a molecule of air — about 80,000 will be nitrogen & 20,000 will be nitrogen…minus some offset by various other stuff. Molecules of CO2 will be represented by 39 or 40 people, depending on overall attendance, and those 39 or 40 are enough to be cause for concern for changing total climate for the catostrophic worse…especially if/when their “attendance rate” surges to 45 or more. There has been no global warming at all during the past 15 years? Ken, it’s a good thing you pointed this out. That means there’s no reason to think LSD can have any effect on people at the doses taken “in the street” since they lead to a concentration by weight in the blood of around 5 parts per million, so that there’d be about a half of a person in your stadium. Wayne: well not quite. He makes the point that a correlation is not enough to demonstrate a cause while a failure of correlation is enough to disprove a cause. Disproof works for CO2/temperature. The correlation has failed so the causal link is disproved. But we only have correlation for sunspots/temperature (Svensmark’s work is “perhaps”) so nothing is proved in respect of cause and effect. I generally admire Monckton’s output but I feel his tying temperature to solar activity so unambiguously to be a mistake. Post hoc ergo proctor hoc is a logical fallacy, but epidemologists consider it a causal criteria. Epidemologists also consider “is it plauasable?” to be a causal criteria. In other words, do you believe it is true? Dr Muller has too of the nin causal criteria going for him. Here are the causal criteria. The trick to using analogies is to be consistent — arguing a biological analogy against a geophysical one makes no sense as there’s nothing common whatsoever. To extend the stadium analogy, consider CO2 concentrations in the artificial environment of a greenhouse — at about 1000 to 1500 ppm (achieved via CO2 generator use such as: http://www.johnsongas.com/industrial/CO2Gen.asp ). For a stadium with about 100+K people, that works out to about 100 to 150 attendees — plenty to make a visible (& often audible) difference, though not much. The stadium analogy of no observable effect fits observed patterns (e.g. http://climate.nasa.gov/keyIndicators/ ) much more realistically than the alarmist emphasis, also available at the NASA link (e.g. radical CO2 increase, as measured in geological time…with debates about the exent of, or if any, warming is even occurring today vs. pre-historic periods of lush tropical conditions associated with half the asserted CO2 concentration). Note the lengthy absence of warming, and some cooling trends, during the 1970s while CO2 rose steadily. THAT non-warming period also, by the way, correlates to relatively low solar actvity associated with above average cosmic ray penetration of the sort now associated with cloud formation (“Dr. Svensmarkâ€™s cosmic-ray effect”). At any rate, as far as heat retention goes, the artificially high CO2 concentration in a greenhouse has surprisingly little impact compared to the “greenhouse effect” (energy reflections off the glass). That’s something one can check via day-night variations for various set-ups. The analogy remains illustrative of patterns fitting observations…not of any actual geophysical process. I certainly don’t claim that the stadium analogy is useful in understanding the effects of drugs in the bloodstream. I do claim that it makes no better an analogy for molecules with different radiative characteristics in the atmosphere. Ray: You are comparing apples to oranges when using epidemiology as a comparison to climatatology, but for argument’s sake I’ll go along. Yes there is a strong correlation of CO2 rise and temperature rise as clearly seen in all the graphs. However, every decent study also demonstrates that the rise in CO2 lags behind the rise in temperature (studies range from 100 to 800 years lag time). This thoroughly violates criteria #4, Temporality. If an epidemiologist determined the disease occurred before the exposure, he/she would say,”Oops, wrong path to take for determining the cause. Likely this correlation is a result of the disease”. This intuitive, logical (as in Classically trained) analysis has not been employed by some of our “esteemed” climate scientists. PS: in my previous post,I admit that the line “…Likely this correlation is a result of the disease” makes no logical sense precisely because the climatology/epidemiology analogy makes no sense. I’m sorry, but the majority of scientists DO consider that to be ‘sound’ science. 1) elevate the ‘meaning’, the value, of correlation. -) To do these things, they additionally reject (where necessary) fact, logic and reason. -) That is their science in a nutshell. They have their kind of science, and you have your kind of science. You do not have to like it, but that is what is. Your problem is that you are trying to ‘correct’ something that cannot be corrected: as a matter of definition. Sorry old bean, but the vile evils of Christianity, with its stupid ideas of ‘truth’ and ‘correction’, have been replaced with highly intelligent humanist philosophies such as ‘evidence of’ and ‘multiple explanations for’. So please stop all this nonsense babbling of yours, wot wot. You are wasting your time trying to get an alcoholic to switch to water. You really should understand this, because at present you are only preaching to the choir, bub. I will give you a tip, old boy. A lot of us stupid Christians knew this kind of nonsense was coming, i.e. the death of truth. If you are so deeply stupid as to be unable to note the utter improbabilities that circumscribe the ‘science’ of Evolution, then you are more brother with the hippies than not. Then you have no business opposing them: you have already lost the battle at its root – and no amount of ‘classical training’ will keep you from drowning in the end. What struck me when browsing the latest BEST paper was the similarity between the BEST “attribution study” and the simple argument employed in Monckton’s presentations (where Monckton at least uses global STA estimates instead of land STA). I can’t see anything wrong with checking such things on the back of an envelope as a “what if” exercise; but that’s just what it is and nothing more. Unless, maybe, if you are already prepared to be “converted”: then something like a brief flash of light might be enough. Hello everyone. All that has to be done to disprove the warmists’ claims are to cite warm climates historically verified before CO2 could possibly have been an issue, e.g. Greenland, Rome, etc. Would this argument have the same validity as Dr. Muller’s? Has anyone done a similar study using ninjas? Previous Previous post: Richard Muller’s Political Move—BEST is Best? Sophisticated Statistics!